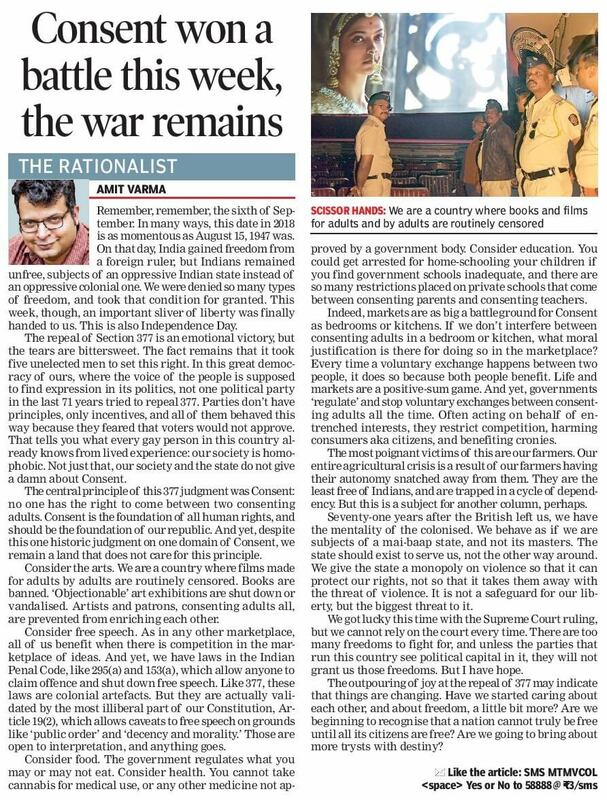 This is the 11th installment of The Rationalist, my column for the Times of India. Remember, remember, the sixth of September. In many ways, this date in 2018 is as momentous as August 15, 1947 was. On that day, India gained freedom from a foreign ruler, but Indians remained unfree, subjects of an oppressive Indian state instead of an oppressive colonial one. We were denied so many types of freedom, and took that condition for granted. This week, though, an important sliver of liberty was finally handed to us. This is also Independence Day. The repeal of Section 377 is an emotional victory, but the tears are bittersweet. The fact remains that it took five unelected men to set this right. In this great democracy of ours, where the voice of the people is supposed to find expression in its politics, not one political party in the last 71 years tried to repeal 377. Parties don’t have principles, only incentives, and all of them behaved this way because they feared that voters would not approve. That tells you what every gay person in this country already knows from lived experience: our society is homophobic. Not just that, our society and the state do not give a damn about Consent. The central principle of this 377 judgement was Consent: no one has the right to come between two consenting adults. Consent is the foundation of all human rights, and should be the foundation of our Republic. And yet, despite this one historic judgement on one domain of Consent, we remain a land that does not care for this principle. Consider the arts. We are a country where films made for adults by adults are routinely censored. Books are banned. ‘Objectionable’ art exhibitions are shut down or vandalised. Artists and patrons, consenting adults all, are prevented from enriching each other. Consider free speech. As in any other marketplace, all of us benefit when there is competition in the marketplace of ideas. And yet, we have laws in the Indian Penal Code, like 295(a) and 153(a), which allow anyone to claim offence and shut free speech down. Like 377, these laws are colonial artefacts. But they are actually validated by the most illiberal part of our Constitution, Article 19(2), which allows caveats to free speech on grounds like ‘public order’ and ‘decency and morality.’ Those are open to interpretation, and anything goes. Consider food. The government regulates what you may or may not eat. Consider health. You cannot take cannabis for medical use, or any other medicine not approved by a government body. Consider education. You could get arrested for home-schooling your children if you find government schools inadequate, and there are so many restrictions placed on private schools that come between consenting parents and consenting teachers. Indeed, markets are as big a battleground for Consent as bedrooms or kitchens. If we don’t interfere between consenting adults in a bedroom or kitchen, what moral justification is there for doing so in the marketplace? Every time a voluntary exchange happens between two people, it does so because both people benefit. Life and markets are a positive-sum game. And yet, governments ‘regulate’ and stop voluntary exchanges between consenting adults all the time. Often acting on behalf of entrenched interests, they restrict competition, harming consumers aka citizens, and benefiting cronies. The most poignant victims of this are our farmers. Our entire agricultural crisis is a result of our farmers having their autonomy snatched away from them. 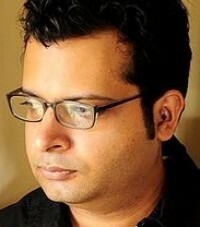 They are the least free of Indians, and are trapped in a cycle of dependency. But this is a subject for another column, perhaps. 71 years after the British left is, we have the mentality of the colonised. We behave as if we are subjects of a mai-baap state, and not its masters. The state should exist to serve us, not the other way around. We give the state a monopoly on violence so that it can protect our rights, not so that it takes them away with the threat of violence. It is not a safeguard for our liberty, but the biggest threat to it. We got lucky this time with the Supreme Court ruling, but we cannot rely on the court every time. There are too many freedoms to fight for, and unless the parties that run this country see political capital in it, they will not grant us those freedoms. But I have hope. The outpouring of joy at the repeal of 377 may indicate that things are changing. Have we started caring about each other, and about freedom, a little bit more? Are we beginning to recognise that a nation cannot truly be free until all its citizens are free? Are we going to bring about more trysts with destiny?